Because sometimes 789 hp isn't enough. Only 500 units exist and all were quickly sold. The price? At least $837,000, give or take. The McLaren Senna may not be the prettiest hypercar on the market but it is, without question, one of the fastest. It must earn the name ‘Senna’ and, fortunately, the late Ayrton Senna’s family gave McLaren its blessing. 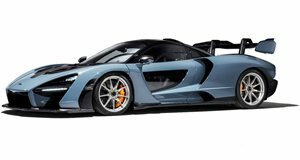 With a total of 789 hp and 590 lb-ft of torque thanks to its 4.0-liter twin-turbocharged V8, the McLaren Senna is not your typical street-legal hypercar. Or any car, for that matter. It’s undeniably fast and powerful and Texas-based tuning outfit Hennessey Performance has come up with a couple of ways to make it, well, even faster and more powerful. Introducing the McLaren Senna HPE900 and HPE1000 Performance Upgrade Programs. Both packages feature high-flow air filters, intercooler system upgrade, twin turbo system, and stainless steel exhaust improvements. The latter receives some additional attention via a Motec engine management system and transmission system upgrade. Each package provides owners with some exterior emblems, serial numbered dash plaque, and a second numbered plaque in the engine compartment. Hennessey also points out that these new power ratings are estimates and that actual power will be measured at the rear wheels, before and after the tuning upgrades are installed. Official photos have not yet been released (we've included plenty of cool stock McLaren Senna images instead). Pricing for either package was not announced but considering Senna’s aforementioned price tag, we doubt interested owners will care all that much. But the big question is whether there are enough interested owners? This is not your typical McLaren and some owners may want to sell the car one day. Could upgrade packages like these, despite the crazy output, actually diminish value? It’s possible but it’s also too early to tell. But John Hennessey himself has an excellent relationship with McLaren and, more than likely, he would not embark on a tuning program for the Senna without the carmaker’s approval.